Hi! We are Chris and Farrah Brown. 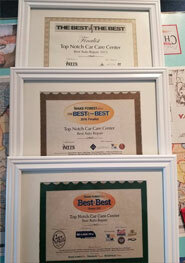 Together for over twenty-nine years, we own and operate Top Notch Autocare LLC. I have worked in the automotive industry for many years but worked in customer care for my entire working life! Chris is an ASE Master Technician with well over thirty years of professional automotive experience. He loves the challenge of finding and resolving difficult vehicle issues and specializes in diagnostics. He takes tremendous pride in every job he does and oversees all work that flows through the shop. It is important to us that we support our technicians reaching their full potential as well. We encourage and provide all our technicians with continuing education classes, ASE certifications, and make sure they have access to all the tools, equipment, and information necessary to complete any job that we take on. We know it is critical to stay up to date on the ever-changing technology within our industry. We are a family run and family focused shop. We appreciate that family time is so important. We work hard at the shop but we encourage our crew to take any time necessary to be present with their families. We gladly offer paid personal time so that they never have to miss the moments you can’t get back. With Chris’ experience, our guys’ commitment to keeping your vehicle in Top Notch shape, and my lifetime of customer care, we make a pretty great team. We want every aspect of your visit with us to be unique and memorable, in the best possible way. We want you to know that you and your vehicle are in the best hands possible! We hope you give us the opportunity to show you what makes us Top Notch!